For the past several years (I lost track of when we began this tradition), I have made this dinner to celebrate New Years Eve. 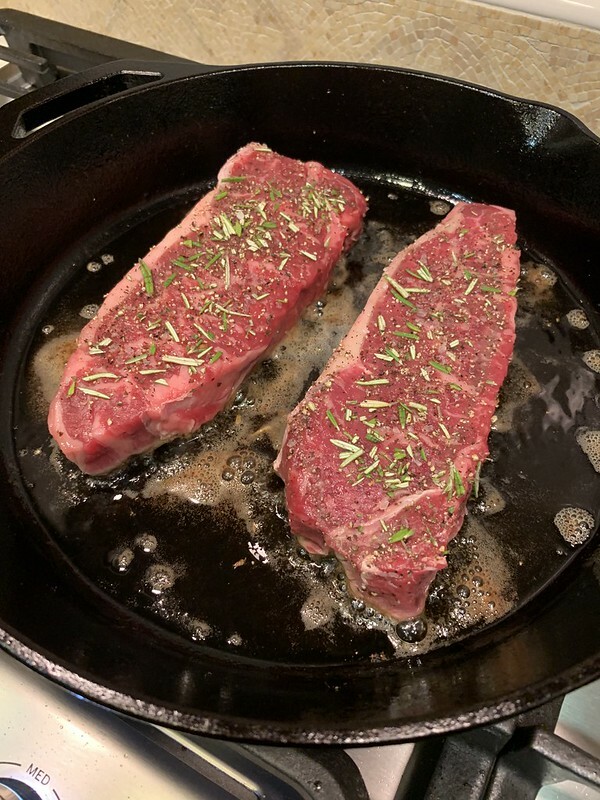 New York steaks on New Years Eve… just made sense (could be the “NY” parallel). 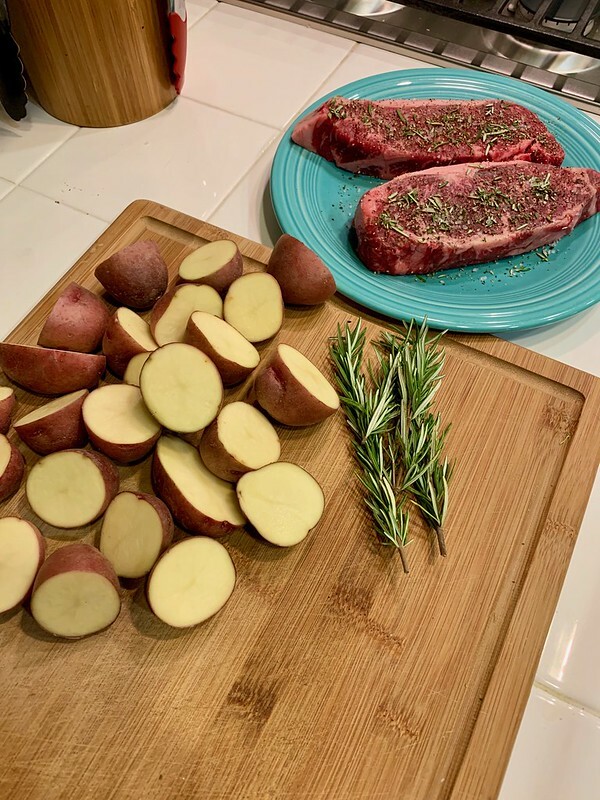 It’s rosemary New York steaks with roasted potatoes. The rosemary and cooking method give it a very nice rustic flavor that goes well with wine and champagne (mostly wine). I usually serve a green vegetable (usually roasted) with the main dish but, this year opted for a crudités plate, with goat cheese and crackers, for an appetizer. That got our veggies out of the way and make for some good snacking. It starts off with going to the butcher counter and selecting the best NY steaks you can find. I like thicker cuts because, well… more steak is better steak. 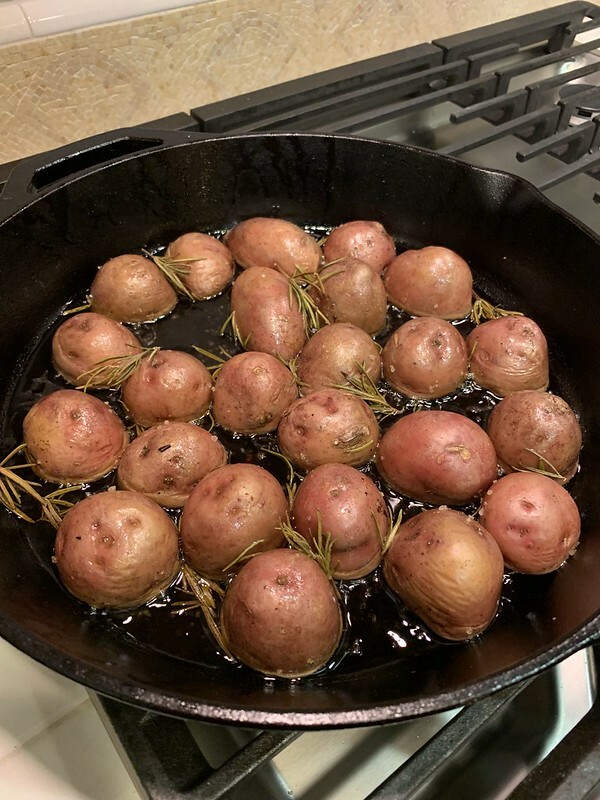 Pickup a 1-2 lb bag of red potatoes and some sprigs of rosemary, and you are good to go. Get a cast iron pan screaming hot (preheat your oven to 425 degrees, with the pan in the oven. Once the oven comes to temp, place the pan on your hottest stovetop burner to bring it up to ~500 deg). Add 1 tbsp. butter and 1 tbsp. olive oil to the pan. When the bubbling subsides, sear one side fo the steaks for 3 minutes. Flip and sear the other for 2 minutes. Cast iron is the way to go but, if you don’t have one, your regular fry pan will do. 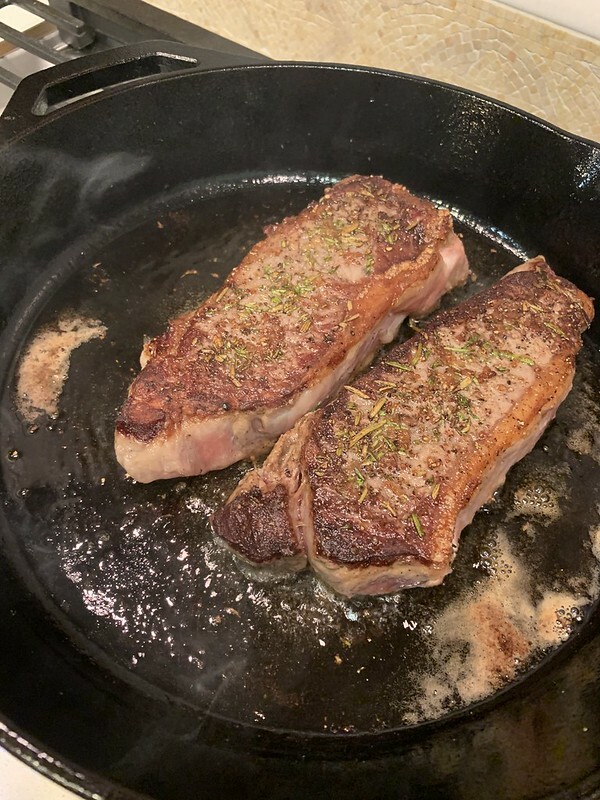 I like the crust/sear that cast iron gives you. The point is to keep it in one dish. I did this once on an outdoor grill, which was nice, but cleanup took longer. Place the steaks on a plate, to the side. Add a little more olive oil, then put your red potatoes (halved) into the pan, cut side down. Scatter some small rosemary sprigs around it. Place in your 425 degree oven for 15 minutes. 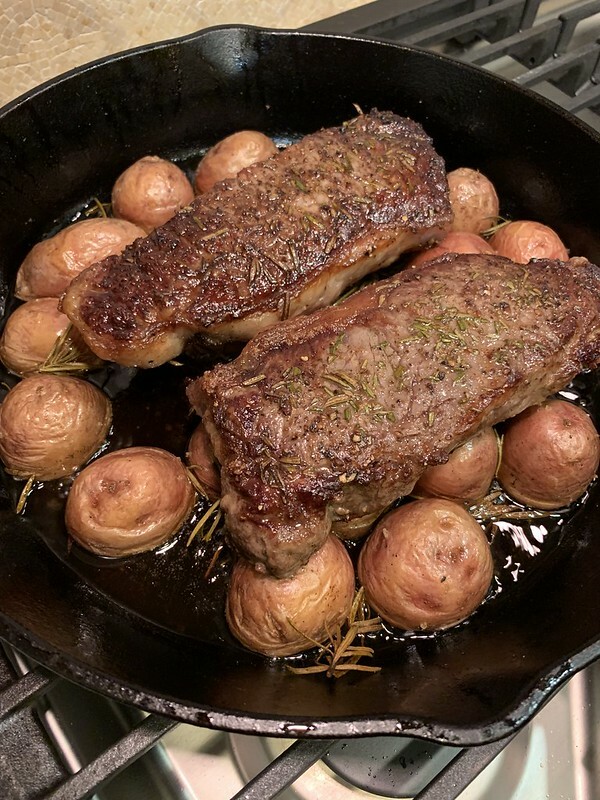 Your bed of potatoes is now ready to welcome your steaks back into the pan. 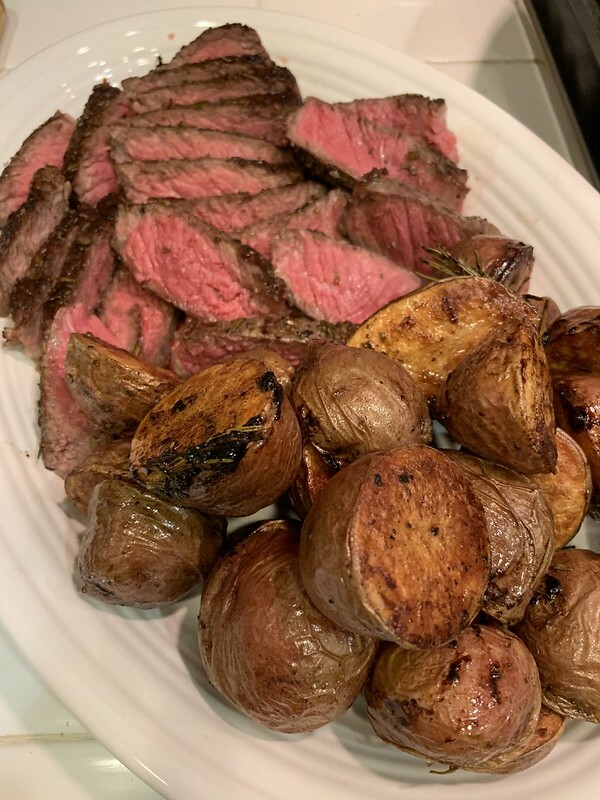 Place the steaks on top of the potatoes, then back into the oven for another ~10 minutes. Depending how don you want your steak, and how thick they are, it may take longer. I like mine medium-rare to medium. Use your thermometer! And, scene! Let your steaks rest while you prep your plates and pour more wine. Slice the steaks thin and serve. Enjoy!